Examine outdoor plumbing fixtures regularly to catch problems early. If your home has an outdoor plumbing system to provide water for sprinklers, irrigation projects, ponds or fountains, you may be wondering what types of maintenance must be performed in order to keep things flowing smoothly. While running water from your home to your outside land can sometimes prove easier than indoor plumbing efforts because you aren’t forced to navigate around walls or floors, outdoor plumbing projects do require some degree of regular maintenance to ensure they continue to function properly. 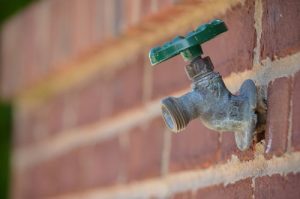 Taking the necessary steps now to ensure your outdoor plumbing systems flow seamlessly is the best way to ensure that you don’t end up spending more in the long run fixing leaks, replacing parts and otherwise enlisting professional help. Keep all gutters, downspouts and yard drains clean and free from leaves, dirt and debris. Keep all window wells clean and free from leaves, dirt and debris. Examine all outdoor hose bibs and faucets to ensure no clogs are present and that water is able to flow seamlessly (if a hose leaks or an outdoor faucet drips, but fails to flow, a cracked pipe could be to blame). Examine any vent pipes for the presence of bird or insect nests. Take care to look closely at the pipes flowing from your dryer to the outdoors, because this is a popular nesting spot. Have a professional inspect and pump your septic tank about every three to five years to minimize the chances you’ll have to replace the filter field, which can prove costly. Consider a sewer line inspection each spring, when water levels often increase due to snowmelt. This will give you an idea of whether any trees or roots have shifted underground within the past year, which can negatively affect your plumbing system. Much like your car, your plumbing systems benefit substantially from a little preventative maintenance. Spending a little time and effort now to ensure your pipes are flowing smoothly can save you a considerable amount in the long run by helping you avoid leaks and expensive repairs while extending the life of your system. Have Questions About Outdoor Plumbing Maintenance? For more about how to keep your outdoor plumbing system in premium working order throughout the year, contact the team at Simpson Plumbing, serving greater the greater Vancouver, Washington area.